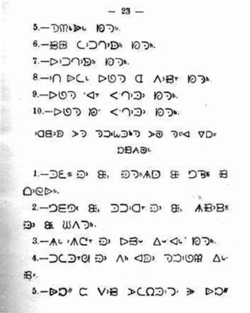 The original script, which was designed for Swampy Cree, had ten such letter forms: Eight for syllables based on the consonants p-, t-, c-, k-, m-, n-, s-, y- (pronounced /p, t, ts, k, m, n, s, j/), another for vowel-initial syllables, and finally a blended form, now obsolete, for the consonant cluster sp-. All were written with a light line to show the vowel was short and a heavier line to show the vowel was long: ᑲ ka, ᑲ kâ. 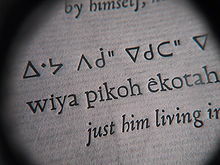 (A hand-written variant, a superscript dot for vowel length, is now used in printing as well.) 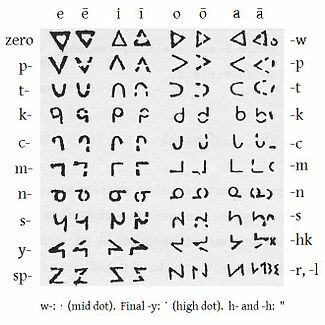 One consonant, w, had no letter form of its own but was indicated by a diacritic on another syllable; this is because it could combine with any of the consonants, as in ᑿ kwa, as well as existing on its own, as in ��� wa.